We have just passed $17m raised, 4 million nets funded and our 60,000th donation! Thank you for your support which has helped protect many people from malaria. 500,000 people participating/ed in fundraising initiatives - currently we are at 476,028. If you could organise a fundraising activity - be it just you, or a group of friends or some people at work - please do! An opportunity to have fun too. Increasing our base of recurring donations from $40,000 per month to $80,000 a month, so we can approach $1m per year. 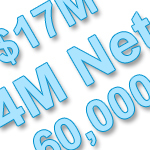 Recurring donations help us plan and 100% buys nets and we include more information here. We have recently updated progress with future distributions.